Pollo al mattone (chicken under a brick) is one of the glories of Italian grilling. It’s so revered by Italian grill masters, that two food-obsessed cities claim its parentage: Florence and Rome. The theory is simple: you grill a spatchcocked chicken under a foiled brick. The weight of the brick compresses the meat, producing a firm, pleasing texture and crackling crisp skin. And the technique keeps delicate meats, like chicken breasts, from drying out on the grill. Then there’s the cool factor—when you’re grilling, never underestimate the cool factor. Few sights look more theatrical than grilling a chicken under a brick. In short, it’s one of those simple, why-didn’t-I-think-of-that dishes that seem impossible to improve on. And yet. The one disadvantage is that a foil-wrapped brick adds nothing to the flavor of the chicken. But what if you used a brick made of salt instead of clay? Enter the Himalayan salt slab. Ten years ago, no one had heard of salt slabs. Today, we can’t seem to cook without them. Salt is an edible rock (virtually the only one we eat), and this one comes from the Khewra Mine in northeastern Pakistan. The second largest salt mine in the world, it formed some 600 million years ago when a shallow prehistoric ocean evaporated. It was discovered in the 4th century B.C., when the horses of Alexander the Great’s army began licking stones in the area. But it wasn’t until 1872 when the British increased mining efficiencies that the salt became a commercial success. Khewra salt ranges from light peach to deep salmon in color; last year, more than 350,000 million tons were brought to the surface. 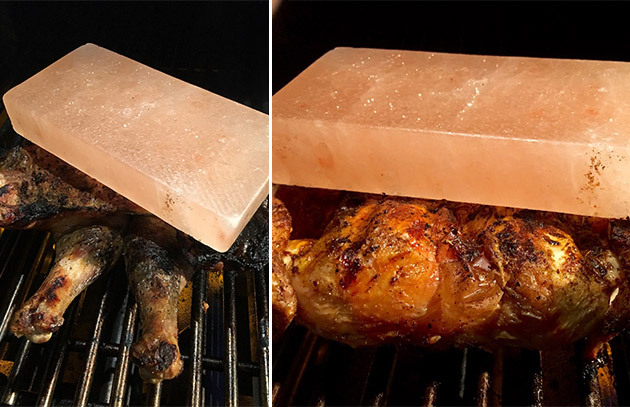 Because of its porosity, ability to maintain both hot and cold temperatures, striking color, and phenomenal taste (some 80 trace minerals make it more interesting than table salt), Himalayan salt slabs have become all the rage in grilling circles. I’ve owned and used salt slabs for many years, but only recently did I realize I’d been missing half their benefit. Like most people, I grilled food on top of the slab. But the real magic happens when you grill food under it. Italian pollo al mattone—chicken grilled under a brick—is excellent. Grilled under a salt brick is off the charts. When I introduced salt bricks to my Best of Barbecue line, I also designed a stainless steel holder for the bricks. The bricks can get too hot to handle by themselves. The holder lets you move them easily without scorching your hand. Here’s a recipe for pollo al mattone salt brick style, but that’s just the beginning. Use them to press steaks and chops and even grilled cheese sandwiches. You can also grill delicate foods, like shrimp and fish fillets, atop the heated brick. What’s YOUR killer app for a salt brick? Post your recipes and photos on my Facebook page and I’ll share the coolest ones. Get the recipe for Salt Brick Grilled Chicken.